Price: Teams are maximum of 4 players, and it’s €10 a head, or €35 per table – WHAT A DEAL! We did The Who What Why When Where Quiz back in July and it was a rollicking success. So, much like Hollywood, we’re slapping a 2 on it, changing the questions, adding some new rounds, and bringing in The Rock to co-star. It’s going to be Bigger, Better, Explosionier and also better. Fun, I mean, it’s going to be fun, come to it. 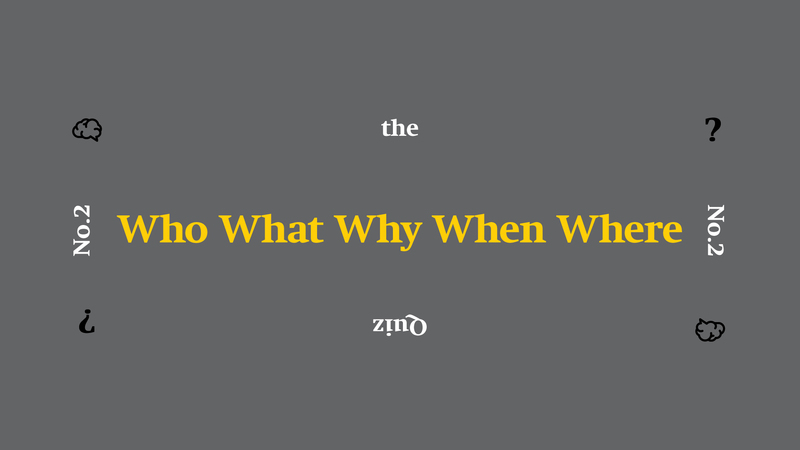 The Who What Why When Where Quiz is basically a general knowledge quiz about famous people, regular things, mundane reasons, historical moments and common places, with some rare peppered in. It won’t be like a normal quiz, but it won’t be so different that you go home feeling like the world has changed and you’ll never feel comfortable ever again. So pull together your smartest pals (or the ones with the most useless information in their brains), or even just a few friends you’d like to sit with for a few hours of good old fashioned trivia fun. Teams are maximum of 4 players, and it’s €10 a head, or €35 per table – WHAT A DEAL! There will be prizes that make your head spin, and the winners will even go home richer than they were before they bought their tickets. Plus, we’ll all grow a little wiser and a little more cynical – isn’t that what we all really want?